The following map shows the intensity of google placemarks on a global scale. Using custom-designed software, a dataset was created based on a 1/4 degree grid of all the land mass in the world (roughly 250,000 points). For each point a search was run on the numbers “0” and “1” in order to create a baseline measure of the amount of online geo-referenced content in each place. In the below map, every place with more than 100 placemarks is highlighted with a yellow dot. When compared to a map of population density (see the map below), the distinct geographies of placemarks become apparent. 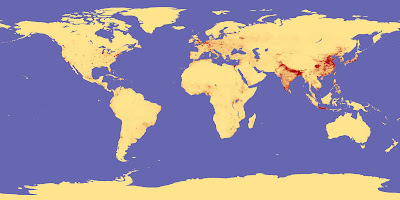 These maps suggest that the GeoWeb is far from being a simple mirror of population density or human activity. Online representations of the physical world are highly concentrated in North America, Western Europe, and the more affluent parts of East Asia and Australasia. Maps displaying placemark density on regional and local scales will be explored in more detail in the next post.